Tallahassee is the capital city of the State of Florida, as well as the county seat of Leon County. The Tallahassee metropolitan region is located in the Panhandle of the Sunshine State and boasts a population of over 350,000 residents. Tallahassee's history is rich in Indian culture. In fact, the word "Tallahassee" is derived from Muskogean Indian word for "old fields" - which in turn was taken from the Seminole tribe of indians. Tallahassee came to be while Florida was still nothing more then an American territory, slowly but surely making its way toward statehood. The people's and culture of the area were greatly influenced by the interaction of Native Americans with the British and Spanish colonists, the Seminole tribe in particular. The Seminoles were so influential in the development of this city that the Florida State University football team is named after the Seminole tribe. The team's mascot is the face of a Seminole Indian chief, adorned with feathers. In 1824, Tallahassee was simultaneously inaugurated as a city and elected the state capital of Florida due to its convenient location between the major cities of St. Augustine and Pensacola. The Florida State Capitol building (picture above) was built to house the state government and legislature, around which the entire city grew. 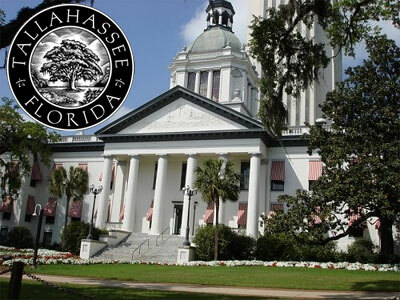 The Florida State Capitol is now a historic monument and museum for the city of Tallahassee. Looking for a reliable mover to relocate you to Leon County? Look no further, Moving On Up™ is here to help. We move students on and off campus for Florida State University and other state and private universities in the Tallahassee area. Our Orlando dispatch office also relocates homes and offices to and from the city of Tallahasse locally in the Sunshine State or interstate across the continental US. Have a question? Contact one of our friendly moving consultants now toll-free at 1-800-945-9569 to schedule your move, or to answer any questions regarding pricing, packing, your inventory, moving insurance and more. Homes.com: Local Real Estate for Houses, Condominiums and Townhouses in Leon County. ApartmentGuide.com: Planning to rent? Apartment Guide has rental listings for all property types for Tallahassee, Florida. City-Data.com: Get detailed information about the Tallahassee metropolitan area before you move from City-Data.com. This site includes information on Tallahassee's demographics, neighborhoods, business opportunities, education and more. Ready to book your move with our moving company? Simply fill out the form conveniently located on the top left of this page for your FREE moving quote! One of our moving consultants will contact you shortly to further assist you with all your moving needs. Thank you for visiting and good luck on your upcoming move!